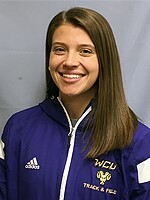 Back in 2016-2017: Qualified for the Women’s Pole Vault at the 2017 PSAC Outdoor Track & Field Championships. Kate Lynch (Allentown, Pa./Emmaus) had a strong afternoon on Saturday as well as she registered a mark of 10-11 ¾ to capture the pole vault at the DeSchriver Invitational. In addition to giving Lynch a victory in the pole vault on Saturday afternoon this mark also serves as a PSAC qualifying standard in advance of the PSAC Indoor Championships in the coming weeks. 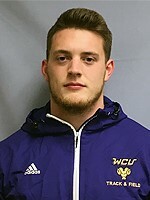 Ralph Casper (York, Pa./York Suburban) performed very well on Saturday afternoon capturing a pair of victories at the DeSchriver Invitational as he won both the shot put and weight throw events. Casper won the shot put for the second week in a row and he also hit an NCAA Provisional qualifying mark for the second week in a row with a mark of 54-4 ¾ . Casper followed this up with a victory in the weight throw as he registered a mark of 56-7 ¼, which also serves as a PSAC Qualifying standard for the sophomore. Casper’s impressive efforts on Saturday afternoon also give the sophomore the third best mark in the PSAC in the shot put and weight throw as the calendar turns to February.